I always get into a bit of a funk come late February. Here in Kansas City there’s usually no snow, nor is there any green grass as we are in a weird and lingering in-between phase of the seasons. This time of the year is most often the coldest, windiest part of the year and it seems to inch by for me. In February, everything takes on a monochromatic blah brown outside, and as always, we are eager for new growth to appear in any form and for warm air to greet us when we wake. To get by and make for happier days, we listen to a lot of upbeat music (have you heard The Lumineer’s new song Ophelia? It’s beautiful. ), eat a lot of leftover Valentine candy, watch Jimmy Fallon on DVR, make crafts to keep busy, and go for walks on the trail when we are feeling really cooped up. Fresh air is always the bet medicine and getting out of the house in the afternoon always does everyone, especially little Theodore, some good. 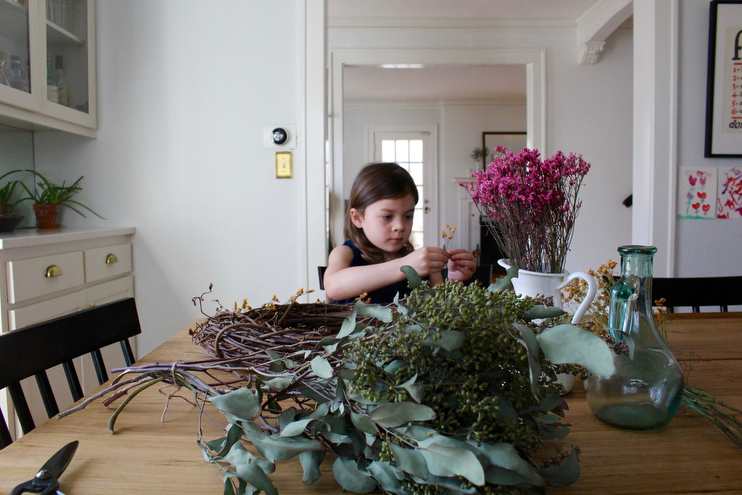 Speaking of crafts, for the past few months I have been drying flowers around our home to use for various projects. Some bits of the natural world lend themselves to preservation more than others. Eucalyptus, wax flowers, lavender, yarrow, and other filler plants with woody stems and clusters of blooms make for wonderful dried bouquets, whereas flowers with a higher water content like tulips…not so much. I prefer air drying for flower preservation. It’s where you tie a little string around the stems and let hang for a few months in the open air. This method is fool-proof and provides simple decoration for our home. Stella has yellow yarrow drying above her bed and we’ve got lots of greens drying in the kitchen. I have different types of eucalyptus hung here and there which are really pretty. When I want to make a bouquet for a friend or simply have a new arrangement on our mantle I’ll just go pluck a few stems here and there. I love that dried flowers are always on hand, they make me happy. 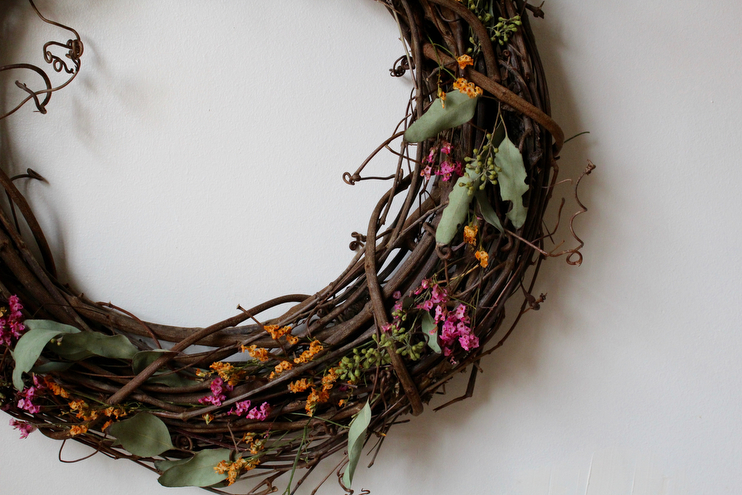 For this wreath we used grapevine as a base since it easily allows you to weave in the dried flower stems. You can find them at any craft store and they are fairly inexpensive. I let Stella pick what flowers she wanted for this wreath and she opted for soft pink, bright orange, and a muted green. We worked together, taking turns tucking the plants and flowers within the grapevines while Theodore colored and Alfie napped. It took maybe thirty minutes altogether? Simple and sweet. All you’ll have to do it snip the flower leaving about two to three inches of stem to work with. You’ll then tuck them in so the stem is fully woven into the base with the colorful flower peeking out. You can put as many or as little flowers as you want in the base, it’s totally up to you. We left a little grapevine peeking through because it’s just too pretty. This craft was a really easy one to do with Stella (who is four) because there’s really no wrong way to weave in a flower. In fact, the more creative you get with this the better! The only thing to be mindful of is that dried flowers are more delicate than one might assume, so be prepared to make a mess. As long as you’ve got a vacuum nearby or a small dustpan and brush you’ll be fine. Stella did almost the wreath herself which was fun to watch, I just put some fillers in spots that needed it, making the final product appear more full and complete. Once we were done we decided to hang it in the kitchen above our table so we would be able to enjoy it more throughout the day, but we may just have to move it to the front door once spring really rolls around. 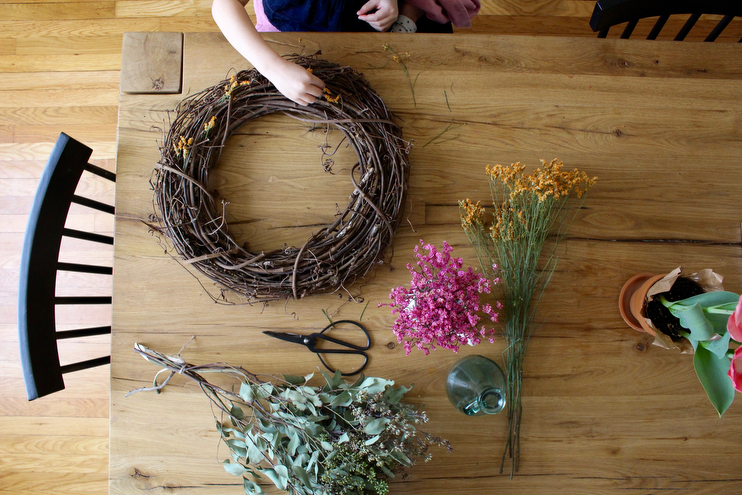 I hope this inspires you to get crafting with your little one and make a gorgeous spring wreath for your home! And if you’re bored and need a laugh, check this out. I love Gary. Also, you can read more about preserving nature here.